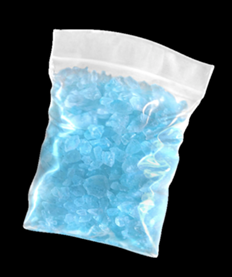 Bring sugar, corn syrup, 2 drops of blue food coloring and 4 Tbs water to a boil in a small saucepan, stirring until sugar is dissolved. Don’t stir, but occasionally wash down sides of pan with a pastry brush dipped in cold water to prevent crystals from forming; boil until mixture turns golden, 5 to 7 minutes. 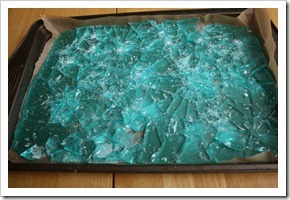 Line a few baking sheets with nonstick baking mats or parchment paper. (Cut it down to better fit the pan, it will make it easier to remove. Pour the melted sugar mixture in a line down the center of the pan. Using the back of a serving spoon or metal table spoon, spread sugar into a thin flat sheet. Bring sugar, corn syrup, and 2 Tbs water to a boil in a small saucepan, stirring until sugar is dissolved. Don’t stir, but occasionally wash down sides of pan with a pastry brush dipped in cold water to prevent crystals from forming; boil until mixture turns golden, 5 to 7 minutes. Pour the melted sugar mixture in a line down the center of the pan. Using the back of a serving spoon or metal table spoon, spread sugar into a thin flat sheet. Glass slides are pretty thin, so the thinner the better. It will also be easier to cut in the next steps. Drip one very small drop of red food color. WARNING HERE if your pan it not level or you tile the pan the food color will run. Once you have the mixture spread into a flat sheet, let it cool and harden for 5-10 minutes. Once the mixture is hard, pull it away from the mat or parchment. If its super thin, try not to crack it. Place the blade of a large knife directly into your burner to heat. If you have an electric stove, you can use a lighter. Once the blade is hot, begin to cut your sheets of sugar into strips. Cut edges to be the length of a real slide. Its good to have a glass slide to use as a template. This step can be a bit annoying. Don’t worry if you break a few, it happens. Reheat the blade for each cut. Between each cut, wash your blade off with water to keep the sugar from burning to your blade. I don’t suggest using your best knife, since this heating and cooling isn’t the best treatment for your chef’s blade. If the edges are really rough, dip your finger and water and smooth them out. 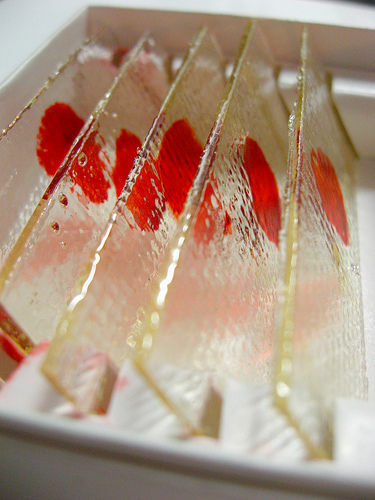 Lay your cut slides on your baking tray and refrigerate for at least 15 minutes. These are VERY Fragile so be careful. 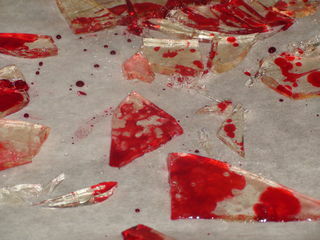 Worse case scenario you end up with bloody shards of glass.